Yeomen are the office managers of the Navy. The U.S. Navy established the Yeoman rating, one of its original chief petty officer ratings, back in 1835. The word yeoman traces its etymology to medieval England, where it referred to an attendant to a member of the nobility (and is the origin of the phrase "yeoman's work" meaning someone whose work is never done). Note that the Navy refers to its jobs as ratings and its ranks as rates. Yeomen in the 18th and 19th century U.S. were non-slaveholding family farmers with small properties. When the word crossed over into maritime lingo isn't entirely clear, but it's been in use in the British Navy since 1816. A yeoman of signals refers to both a petty officer and a communications specialist. In the modern-day American Navy, yeomen perform administrative and clerical work, operating office equipment like computers and fax machines They also answer telephones, type, sort incoming mail, organize files and do all manner of office writing. This may include business and social letters, notices and reports. In addition, yeomen perform office personnel administration, maintain records and official publications, and perform administrative functions for legal proceedings, such as preparing briefs and other documentation. Yeomen are usually assigned duties in an office environment. People in this rating may work alone with little supervision, or work closely with others under close supervision depending on the assignment. An equivalent civilian job to yeoman would be an office manager or administrative assistant. They keep the front office moving and are important in the day-to-day activities. Yeoman class A school is about seven weeks long, and is located in Meridian, Mississippi. Recruits must have Armed Services Vocational Aptitude Battery (ASVAB) scores in verbal expression (VE) and mathematical knowledge (MK). 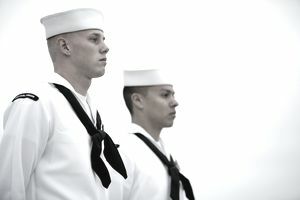 Sailors in this rating need a secret security clearance from the Department of Defense, since they are potentially dealing with sensitive information and documents. This requires an extensive background check, and some previous drug or alcohol abuse may be disqualifying factors. Yeomen must be able to type a minimum of 40 words per minute once they've graduated from A school. Here's how the sea and shore rotation breaks down for the yeoman rating. The companion rating to the YN yeoman is YNSS, which is yeoman, submarine. A sailor in this rating has all the responsibilities of a YN yeoman but is stationed aboard a submarine. Recruits for this rank take four weeks of basic enlisted submarine school training in Groton, Connecticut and then take the A school training for yeomen in Meridian that their counterparts take.